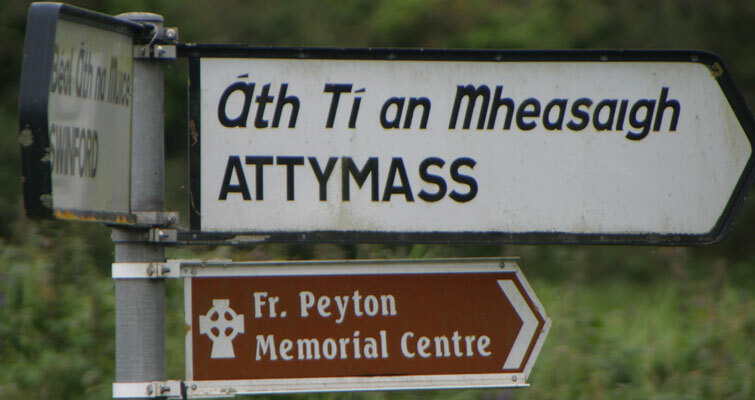 Six miles south of Ballina, sheltering at the foot of the Ox mountains, is the parish of Attymass. It is the birthplace of Fr Patrick Peyton, the world famous founder of the Family Rosary Crusade. It has an abundance of ancient heritage including: crannogs, ring forts, megalithic tombs, court tombs, holy wells, Bronze Age cooking sites and Ogham stone. ▪ The famed salmon-fishing River Moy flows through Attymass with easy accessibility at many different points. ▪ In the area there are a total of seven coarse fishing lakes. Blessed with rugged and enchanting countryside and the added bonus of pollution-free air, Attymass is a dream destination for walking enthusiasts. Ranging in distance from three to ten miles there are bogland walks, mountain walks and historical walks offering panoramic views of the surrounding landscapes.